For those folks living in Canada that do not get out much or are too busy swatting mosquitos and black flies all summer or shoveling snow all winter to never have had the experiece of knowing what Rotel is…. Let me enlighten you. Rotel is a marvelous product made by ConAgra Foods in the U.S. Here is what it looks like in a can. This stuff is amazing. Many, many Americans use it in just about everything they cook…except maybe pancakes or a souffle, as I am sure that wouldn’t go over very well with your family. Many egg dishes, and any South-West/Mexican style of dish or sauce gets a healthy dose of this stuff. Awesome in Chili or even used right out of the can as a salsa, it truly is one of the greatest inventions EVER! *Almost* better than chocolate…ALMOST. BUT…it is NOT sold in Canada. I have been lobbying the company for several years, even threatening to cut off their chile pepper supply if they don’t bring it across the border. I even threw a temper tantrum. But apparently all my efforts had been in vain. Make my own of course, and I was darn determined to do just that….somehow…. So last year when I decided I wanted to grow different varieties of Chile Peppers in my garden, I first headed to my local Chapters Bookstore (like Barnes & Noble for you U.S. readers) and picked up an amazing how-to-know-it-all book on growing peppers. The absolute ultimate guide in growing peppers. I have not regretted buying this book since I picked it up. 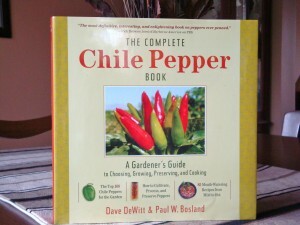 Anyone that is attempting to grow their own peppers, you need to pick up this book. You will not begrudge the money spent. After I started my peppers and had them growing in the garden, I had a chance to sit and read through the rest of the book. Well, let me tell you, I was SO excited at what I found at the back of the book – do you know what was there??? Lots and lots of them in fact. This book is beyond know-how and how-to, it is also HOW TO MAKE YUMMY, SUPER SPICY FOOD. Amongst these glossy pages of peppery goodness, I found the holy grail of recipes. How to make your own Green Chiles with Tomatoes….aka Rotel….why oh why did I not discover this book sooner? I did modify the recipe to use fresh peppers as their recipe called for roasted New Mexico chiles, and lots of them but because of the significant increase in heat on the Scoville scale, I reduced the amount of fresh jalapenos or serranos so as not to blast my taste buds off the planet. But I think I have made you read enough, so let’s get on with it shall we? Wash and sterilize canning jars and lids so they are ready (I keep jars on a sheet pan in the oven held at 225F). Combine all ingredients in a sauce pan, bring to a boil over medium-high heat, cover, reduce heat, and simmer for 5 minutes. 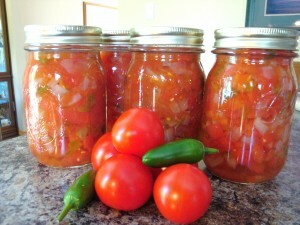 Ladle into hot, sterilized canning jars, taking care to use all the liquid and leaving a 1/2″ headspace. Process in a boiling water canning bath for 30 minutes (start timing when water returns to a boil). Remove from canner and let cool on wire racks. Label and store in a cool area. Makes about 5 x 250ml jars. * Half of the vinegar can be replaced with Lime Juice or Lemon Juice for a different flavour. There you have it, your very own Rotel, made by you to be enjoyed by all. I now thumb my nose at ConAgra Foods ~ Ha! Thanks for your question Gord, yes, 3 cups of chopped chiles goes into the recipe…if you feel it is too much, cut back a little, but make up the difference with tomatoes. Also, use milder chiles (anaheim’s or cubanelle’s) if you do not like the prospect of fiery hot serranos and jalapenos. This recipe came directly from the book highlighted in this post and it worked out perfectly for me. Cheers! I know I’m getting old, but I can only read 1(one) cup of chilies. Has that been changed then? 1 cup of sliced or diced chiles to 4 cups diced tomatoes (or to your preference. It will be milder than you expect without the seeds. I decided to seed the jalapenos in my homemade salsa for the first time. Usually 3 jalapenos whole gives it a good kick. With them seeded it was so mild I was almost disappointed for lack of spicyness. Amazing what the seeds contribute! How many jars (what size) does this recipe make? Hi Michelle ~ this makes about 4- 5 of the 500ml mason jars. Hope you give it a try and enjoy it! Although this looks good I’m pretty sure Rotel doesn’t have cilantro in it. Looks like it would make an awesome salsa though! You can buy Rotel with Cilantro in it. They make it regular and with Cilantro. It is an amazing salsa either way you look at it! Should there be onion in this recipe? Only if you want them in there. Personal choice! Ro*Tel has 6 different blends, but I think the one with cilantro is the best. Thank you for this recipe! I wish I found it a month ago when my tomatoes and peppers were at their peak. Will definitely try this next season! You are welcome! It’s tough to have to wait so long isn’t it? I just put the last of my gardens to bed for a long winters nap. What is the excuse that ConAgra Foods make for not expanding to Canada? Seems almost stupid to ignore a 35 million person market. I email ConAgra all the time and phone as well. They don’t care with just one or 2 people emailing. We need a whole bunch doing it. Just to enlighten you .. Us people in Canada do get out often. 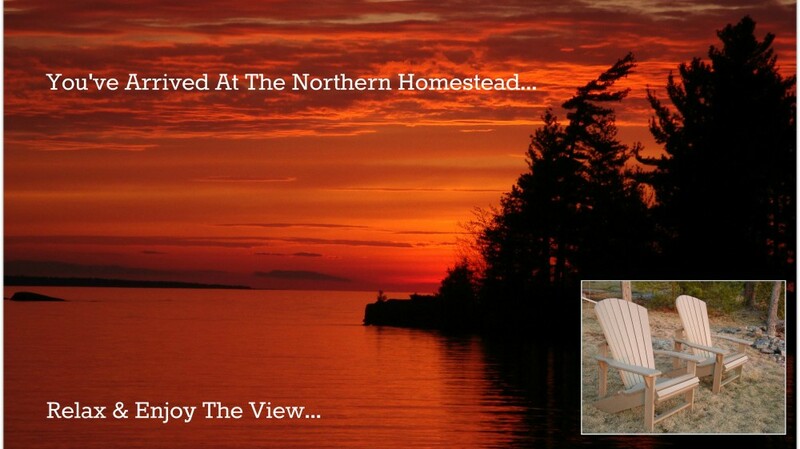 We have some beautiful scenery here as well as some glorious summers. Winters .. meh, sure we get lots of snow but still a lot of fun activities to do. You should come play on our Island and see for yourself! Proud to be a Canadian from little ole PEI! Well of course I know folks in Canada get out, I was being tongue-in-cheekie My bucket list does include the East Coast, looking forward to seeing your part of the country! I’d i use a pressure cooker What pressure 10 or 15 ? How long? I don’t have a pressure cooker so do not have any idea how long it would take. I would follow the manufacturer’s guidance of the appliance as a start though. Thank you! It’s been years since I’ve been able to make the rotel and velveeta dip for Super Bowl. Hopefully it will live up to my memories. And yes, I’ve tried several times to get them to tell me why they won’t even bring it to New York. I’d gladly drive across the border to stock up! I used to drive over the border and buy a case load…now I don’t have to! I get it in NY and Walmart has their own cheaper brand there that I use when cooking with it, however, I only use the Ro-Tel brand for their famous Queso! Hi. I am a Canadian transplant via Texas, always carting as many cans as I can fit into my suit cases each time. I know there are several varieties of Ro-Tel now, & how great that you made your own recipe! How close would you say yours taste compared, to the Original? Thank you! Have you ever tried freezing this recipe, and if so how did it do? Hi Kim ~ No, I haven’t tried freezing it. I would be worried it would change the texture of the tomatoes and peppers (ie mushy). I moved to Alberta from New Mexico years ago where peeled and roasted green chilies are available everywhere. I haven’t had much luck growing them (not in the volume I would like) and can’t seem to find them in any stores. WalMart sells tiny little cans for about 2 bucks. Do you know of any stores or distributors in Canada? HI there, sorry for the tardy reply, vacation time! and no, I don’t know of any suppliers of roasted green chile’s in Canada. Chiles do need a longer growing g season, I start mine indoors in February so they are well established by the time I can plant outdoors. Mine are in raised beds with plastic I can roll down if it gets too cold. Have you thought about ordering some from the U.S.? Not sure if that is even a possibility, but a thought? I will have to try this. I’m also a Texan in Canada. I’m now back to bringing ro-tel up when my mom or I visit. I’ve never seen the cilantro version. It’s been awhile since I bought it personally in the store though. I’ll have to give this a try. I do love the addition of fresh cilantro. I have never seen Pastene here, interesting! Thanks for sharing! Hi there! I am living in Toronto and about to buy my seeds for this summer. I am determined to try to make my own Rotel this year! When you say ‘New Mexican’ chilis, do you mean ‘Hatch’ peppers? HI Susan, sorry for the tardy reply. Yes, the Hatch chile’s if you can get them. But for mine I just used jalapeños and added a few serranos for some extra heat. Oh thank you! I will have to look into this! Hope they deliver to Canada! Would I be able to mix the tomatoes and chilies together and saute a bit (I’m not adding anything else), put the mixture into freezer bags and then directly into the freezer? I simply don’t have time to water bath stuff and I’m not going to buy everything I need to make 4-6 jars of ro-tel. I have had good luck freezing all kinds of things that other women “water bath” but I don’t know about tomatoes. Whaddayathink? Sorry for the tardy reply, I have been so busy lately, yes, you can freeze the mix, you don’t need to sauté first as tomatoes freeze really well. Just dice and mix everything up and put into the small sized Ziploc baggies. Maybe you published this somewhere but what kind of tomatoes do you use? Paste or regular? This recipe looks very good. But what size jar do you use? Pints? We live in Ontario near the Michigan border and always buy cans of Ro-tel when in the States shopping, but had been looking for a Canadian equivalent product for years. One that we found last year that is close, are the Aylmer Accents canned tomatoes “Chili Seasoned” variety with chili peppers. I am not sure if it is available all across Canada, but it is here in Ontario. Thanks Tina for the suggestion of the Aylmers Accents, I will have to look for them in my local grocers, but with all my canning that I do, I rarely shop in the canned food aisle I look forward to hearing you report back on your go round of making my recipe. Thanks for chiming in here! I almost followed your recipe for rotel, when I was told someone found it in Superstore in Calgary. Since I live in Edmonton, I thought I would check out an Edmonton Superstore, and lo and behold, I found it here too!!! Yes, the real stuff!! While your original research is appreciated, a can opener is still preferable to the work of canning. I just saw Rotel advertised in the “No Frills flyer here in Thunder Bay, Ontario!! Holy frijoles! Finally arriving in Ontario! Thanks for the heads up!